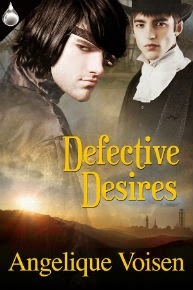 This week, I'm posting another 7-sentence snippet of Defective Desires, my m/m steampunk paranormal romance. The other’s man hazel eyes seemed to bleed to an odd primal shade of amber, and Cod couldn’t mistake the hunger there for anything else. The severe weight of Biff’s desire and yearning pinned him down like a prey caught in a predator’s trap. Cod’s hands froze over his buttons. No one had ever looked at him with such drowning and piercing need in centuries, and he wondered if his own eyes betrayed the same yearning. A low growling sound nearly made Cod jump. “I’d like to see you try,” Cod scoffed, realizing a little late that was the last response the other man wanted to hear. Defective Desires is currently available for pre-order (at a 20% discount) at Liquid Silver Books HERE, and will be out on 17th November.